Well, it happened! January came snowing even in areas where we never thought it would. With temperatures this low, you are surely looking for a warm jacket, preferably a parka if you ask us. 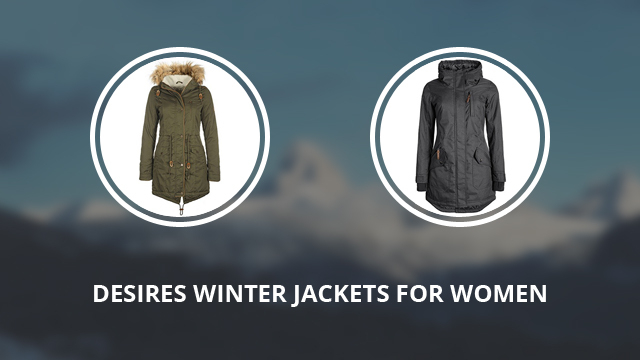 DESIRES is a brand that we would recommend you look into, especially if you are looking for beautiful winter jackets, which are also elegant and fashionable. In today’s selection, you will find eight gorgeous winter jackets and parkas, to get you through this season. We are starting off with Belissa, which is a jacket made of 100% Polyester for both outer shell and inner lining. 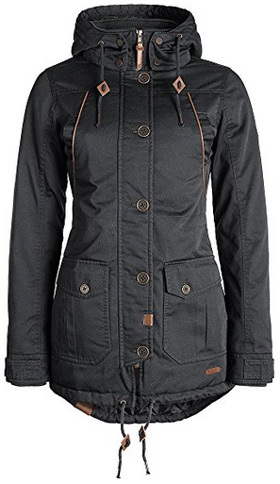 It comes with a hooded collar, also lined on the inside for added warmth and protection. The main zipper is waterproof and is covered by a wide placket. There are several pockets on the outside; two flap pockets on the sides, suitable as hand-warmer pockets, one on top of the right flap pocket, with a zipper closure and one on the left side of the chest, with a vertical zipper. The cuffs are made of a thick and soft material, with thumbholes in them and adjusting snap button fasteners on the outside. This is a hip-length jacket, which covers the back with its high-low design hem. It comes in the colors: Insignia blue, Coffee bean, Ivygreen, Dark grey and Black. 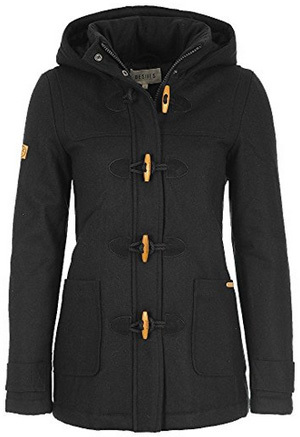 If you liked Belissa but live in a colder and windier climate, or simply prefer a quality parka, then check out Bella. 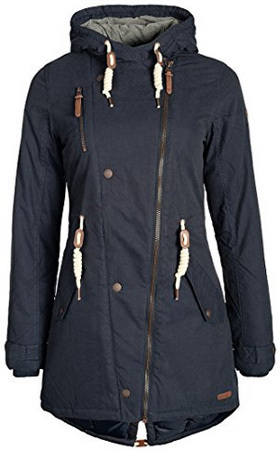 This is a long jacket, also with a high-low hem and a hooded collar. It is made of 100% Polyester, making it water-resistant and wind-resistant. The cuffs are adjustable and the inner ones comes with thumbholes and are made of ribbed, elastic material. The side pockets are slanted, close with a snap-button flap and are slightly oversized. Above the right pocket, is a zipper pocket, while on the chest there is a vertical zipper pocket. The jacket comes with small leather details and fits normally. 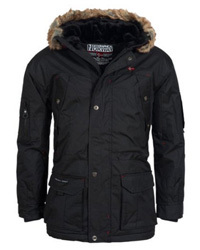 This is suitable for heavy winters as it is a fast-warming jacket that has good insulation. The colors available are: Dark grey, Coffee bean, Insignia blue, Ivy green and Black. What’s not to love about Annabelle? 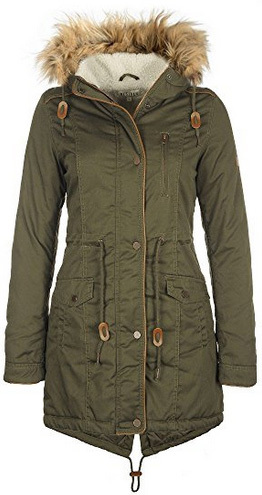 Not only is this parka warm and comfortable, it is also quite stylish. It is made of 65% Polyester and 35% Cotton for the outer shell and has an inner lining made of 100% Polyester. This is a breathable jacket, comfortable to move around in and weather-resistant. The collar is stand-up and it has a detachable hood, which is adjustable by drawstrings. The main zipper begins a bit higher than the hem and is covered by a buttoned placket. There are two oversized flap pockets on the sides, two chest pockets and one inner pocket. The cuffs have decorative fasteners and around the hem, as well as waist, there are adjusting drawstrings. This jacket’s details are made up of a combination of leather and wooden buttons, that give it an interesting look. The color options include: Cinnamon, Ivy green, Insignia blue, Dark grey and Black. An elegant parka for everyday wear, Tilda comes with a minimalistic design, focused on the contrasting white zippers and drawstrings. The material for the outer shell is 65% Polyester and 35% Cotton, with an inside lined with 100% Polyester, which is warm and insulating. 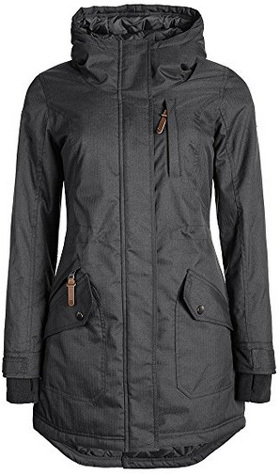 This is a long jacket, with a high-low hem and a two-way zipper closure, which is uncovered. You can easily adjust the fit as preferred, with the drawstrings around the waist, which are placed on the outside. At the back, the hem also comes with adjusting drawstring, to fully insulate the jacket, especially if you live in windy areas. There are two oversized flap pockets and one slanted zipper pocket on the right side of the chest. The cuffs are elastic and prevent cold drafts from getting through. It has a hooded collar, adjustable and lined on the inside. The color selection includes: Black, Insignia blue, Green ivy, Cinnamon, Dark grey and Wine red. 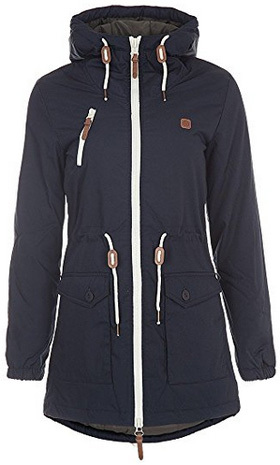 Lew is also a parka with a high-low and cut hem at the back. It has a beautiful design that is focused mostly on the details, which not only complement the jacket’s simplicity but give it a youthful look. One detail that bears mentioning are the white, curly drawstrings and leather stoppers. The main zipper is placed slightly diagonal and the collar is hooded. The material is a combination of 70% Cotton and 30% Nylon for the outside, while the inside is made of 50% Cotton and 50% Polyester. 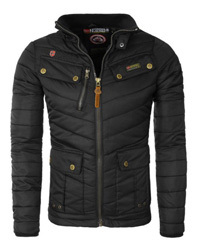 This makes the jacket breathable, light and very warm, however, it is best suited for dry weather or light rain. The inner cuffs are elastic and ribbed and there are two slanted pockets on the side and one zipper breast pocket on the right side. There are five colors available: Cinnamon, Ivy green, black, Dark grey and Insignia blue. Penna is a slightly different jacket than the previous ones, both in style and material. It is made of a blend of 50% Wool and 50% Polyester, which provide a lot of warmth and insulation. The inner lining is made of warm and soft Polyester. It has a stand-up collar, placed on the inside, while the hood is attached to the placket that covers the zipper. The placket closes with both snap buttons and wooden buttons. It has two slide-in pockets on the sides and an inner pocket. This is a hip-length jacket, with a straight-cut hem and comes in the colors: black, Coffee bean, Insignia blue and Grey. And because no jacket collection is complete without fur-lined jackets, we have selected two stylish parkas. Anna is made of 65% Polyester and 35% Cotton, lined with teddy fleece on the inside. 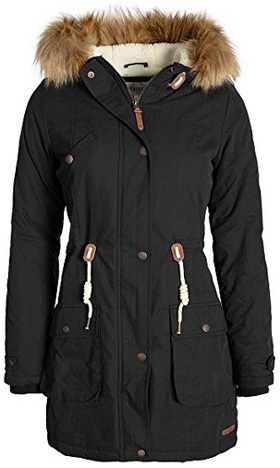 This is a highly insulated jacket, which warms up quickly and is weather-resistant. 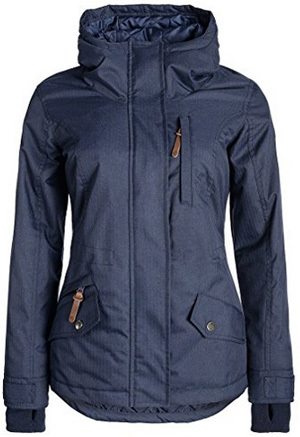 The main zipper is waterproof and covered by a snap-button placket. The collar has an attached hood, which is lined with artificial fur, to not only add style to the jacket, but to also protect the face from icy winds. There are two oversized side pockets and one chest pockets, as well as adjustable drawstrings around the waist and at the back of the hem. The hem comes in a high-low design and is cut at the back. The inner cuffs are warm and elastic, further insulating the jacket. It is a long jacket that does not require too much layering underneath and is ideal for those who prefer dressing lightly while also being warm and cozy in winter. The colors available are: Black, Dark grey, Insignia blue, Ivy green and Cinnamon. Brining us to the end of the selection, is Lewanda, a long parka, with a faux fur lined hood. The outer shell is made of 70% Cotton and 30% Nylon, while the inside is lined with teddy fleece. 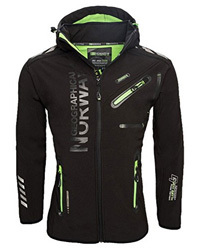 This is a weather-resistant jacket, most suitable for dry and cold conditions. It is adjustable at the waist by curly drawstrings and comes with plenty of storage space, due to the oversized pockets on the sides. 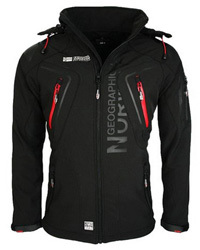 The main zipper is covered and the hood lined on the inside, as is the stand-up collar. It has elastic inner cuffs and snap-button fasteners on the outer cuffs. There are five color options: Black, Cinnamon, Dark grey, Insignia blue and Ivy green.